The Apple HomePod presents a revolutionary way to discover music on a whole new level. Regardless of its small size, this unique speaker can fill the room with your favorite music through its custom Apple-engineered audio technology and advanced software. With a simple command of “Hey Siri”, you can have your Apple HomePod play any kind of music. Impressively, you don’t have to worry about your distance from the HomePod. It is equipped with six microphones positioned around the speaker to detect the slightest of sounds in the room. Despite the design that allows you to place it anywhere on a flat surface, it is advisable to add more stability and protect it from being knocked over. What better way to keep your Apple HomePod safe than to have a wall mount designed for the speaker. Below is a list of the best wall mounts for the Apple HomePod. MERES presents an amazing wall mount specifically designed for your Apple HomePod. It is made with a premium aluminum alloy that boosts additional stability and keeps your device secure at all times. It also has a sleek and clean design that blends in anywhere you decide to place it. Furthermore, its customized design allows you to place or remove your Apple HomePod to the mount without necessarily detaching the cable. It fits this device perfectly. This model is equipped with a non-slip rubber at the bottom to prevent it from slipping. Remarkably, it has a heating out hole at the bottom to keep the circulation of your device normal and prevent it from over-heating. It is quick and easy to mount with included mounting hardware and screws. 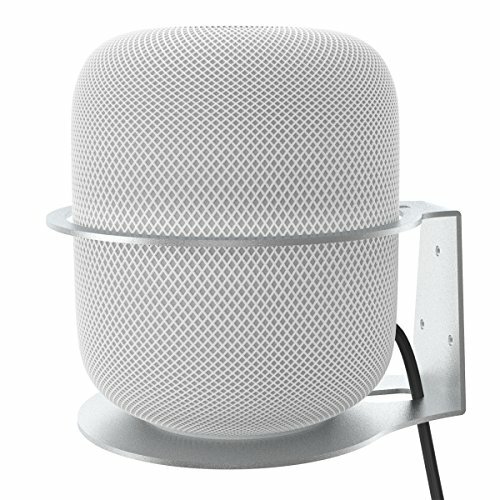 A notable wall mount bracket for the Apple HomePod speaker. This bracket is specially designed to complement the shape of the HomePod speaker. It is made with premium aluminum alloy with refined polishing that can easily withstand your speakers weight of 5.5 lbs. In addition, it enhances extra stability and protection to your device so you don’t have to worry about it toppling over. Its sleek design not only saves on space but also can be decorative. This enables it to be placed anywhere in the room. The VORI Wall Mount is designed not to interfere with the speaker’s functions and sound output. This guarantees high-fidelity audio anywhere it is placed. It is also easy to mount. This unit is accompanied with four screws and four drywall anchors for mounting. The FireArrow Wall Mount is another amazing design for your Apple HomePod. This model is constructed with white acrylic with refined polishing than increases the stability of your devices and ensures protection. 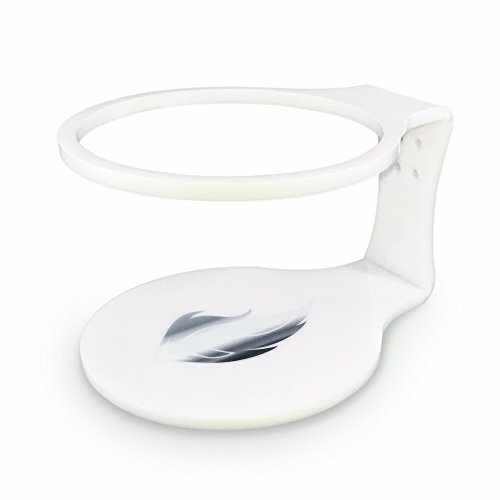 Its white lustrous design enables it to blend anywhere in your home. 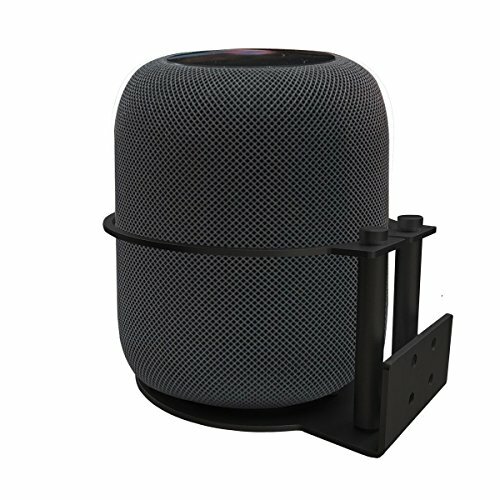 With its simple design, it enables quality sound output without interference and simultaneously gives you the freedom to access the full functions of the HomePod without any obstructions. You also don’t require to detach the cable when placing the device. This wall bracket can easily be installed and mounted. With the inclusion of screws and mounting equipment, it makes it simple for anyone to mount it. This model is also compatible with the Sonos, Amazon Echo, and the Google Home. The AONCO Apple HomePod Wall Mount is another quality design for your device. It is made with 100% aluminum alloy which is durable and enhances extra stability to your device. This also guarantees additional protection to your device at all times. 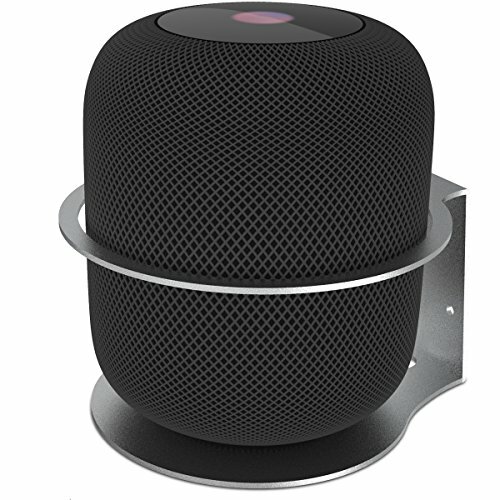 With its simple design, there will be no interference with Homepod functions nor its sound output. READ Best Wall Mounts for the Amazon Cloud Cam. It also saves on space and can be used as a decorative anywhere in your home. With additional round finish on every angle of the mount, it provides extra protection to your HomePod from scratching. This model also gives you the freedom to place and remove your device without detaching the cable. It is also easy to install and it is included with screws and mounting hardware. A wall mount for the Apple HomePod is a necessity if you own this amazing speaker. It gives you the peace of mind knowing that your HomePod is safe and working at its optimal ability.